As one of the earliest forms of sustenance, life from the sea has been an integral part of human history. Our love affair with fish has evolutionary origins. Many anthropologists believe that the incorporation of fish into human diet, with its high omega fatty acid content (which fuels brain development), was one of the main driving forces for our evolution. But fish have become more than just a mainstay on our dinner plates; in many cultures across the globe, they are expressions of our spirituality. When Christianity was still in its infancy, being identified as a follower of the faith ensured persons a meeting with the death squad. Many Christians lived in fear of persecution, as such, finding a way to identify friend from foe was a tricky endeavour. Drawing on Jesus' link with the sea of Galilee, the fish (more specifically, the Ichthys or Jesus Fish) became a means to safely show one's association with the religion while remaining under the radar. Christ was a 'fisher of men' and it's no coincidence that one of Jesus' most famous miracles is the feeding on the multitude with five loaves and two fishes. The natural element, Water, is considered by many to be a representation of our emotions and subconscious mind. As such, those animals that live in or near it are usually seen as expressions of our mental state and there are several sea animals that are known as symbols of the Subconscious. The Starfish, the Whale, the Seahorse, and the Shark are all animals closely linked with providing safe harbour in troubled waters or causing a deluge of emotional uncertainty. This philosophy holds true in Asian cultures, where the sea dominates numerous aspects of local religions and traditions. In many African and East Indian traditions, the Fish is seen as a symbol of Creation, Transformation, and Fertility. The Hindu god, Vishnu, transformed into a fish (Matsya) and saved the world from a horrific flood. Fish are also symbols of Abundance. The Babylonians and Sumerians revered Enki, a Creation deity, while the ancient Egyptians viewed the Starfish as a symbol of Renewal and Healing. In some parts of China, newlyweds are given gifts of fish as a token of Prosperity and to bestow blessings on them in the hopes that they'll have lots of children. Marine animals are also seen as keepers of ancient knowledge. In Irish mythology, an ordinary salmon gained unbelievable insight into the world around it after it ate hazelnuts that fell into the Well of Wisdom, thus transforming it into the Salmon of Knowledge. It was eventually caught by a great wizard who wanted to gain all the knowledge in the world by eating the salmon. But the knowledge locked within the salmon was inadvertently given to the wizard's servant boy, Fionn, who then spent the rest of his life using his newfound wisdom to help others. Little did the ancient Celts realize that fish like salmon are actually rich in the Omega fatty acids needed for brain development! From sexual connotations to expressions of happiness, even our language has been influenced by our love of fish. We can have a 'whale of a time', be left to fend for ourselves in the 'shark tank', or suspect that 'something fishy' is going on. 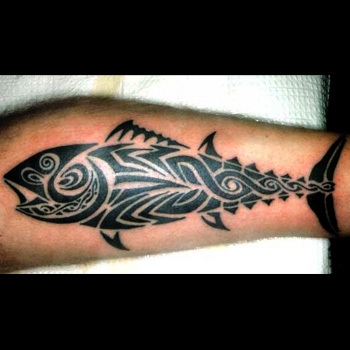 Whether you are on the quest for knowledge or the path of prosperity, Fish Tattoos are great ways to express the complicated and multifaceted side of your persona. There's simply nothing fishy about getting a Fish Tattoo. 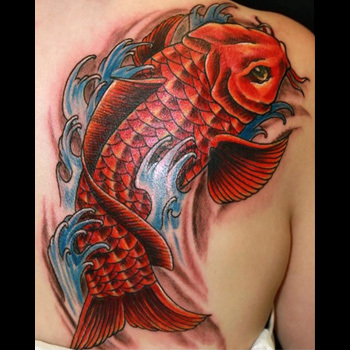 From the intricate patterns and vibrant hues of the Siamese Fighting Fish to the intimidating lines of a Bull Shark, Fish Tattoos come in a plethora of sizes, colors, shapes, and species. The exact meaning of each tattoo depends on the animal being depicted and what symbolism the other elements incorporated into the design hold. The growing popularity of MTV's series, Catfish, has (without a doubt) given Catfish Tattoos an entirely different meaning. To be 'catfished' is to be duped by a person who is pretending to be what they aren't in real life. But even outside the Western context, a catfish is a symbol of negativity and instability. In Japanese mythology, the Namazu brings destruction and chaos by causing deadly earthquakes, accounting for why the image of a catfish is closely linked with the country's Earthquake Early Warning system. 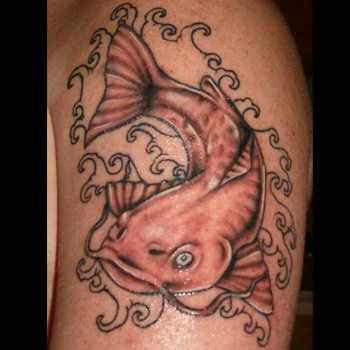 Catfish Tattoos express to the world that you aren't as you may appear to be at first glance. As the totem of the Roman sea god, Neptune, seahorses bring Luck, Guidance, and Protection to those on tumultuous waves. The Chinese revered them as a sort of wise sea dragon, while European sailors believed that seahorses offered safe passage to the afterlife for those lost at sea. 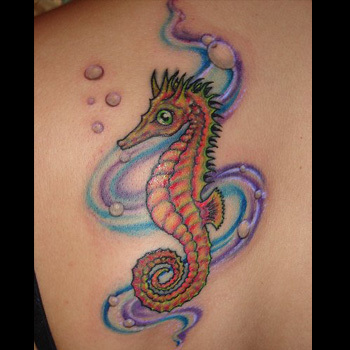 Seahorse Tattoos also symbolize Patience and Friendliness. The Discovery Channel's Shark Week is the channel's most popular event and with good reason. Sharks strike terror into the hearts of men and yet, they are mysterious, beautiful creatures. They are a sacred symbol in many indigenous cultures throughout the world and as one of the world's ultimate predators, sharks represent the untameable and fearsome power of the sea. 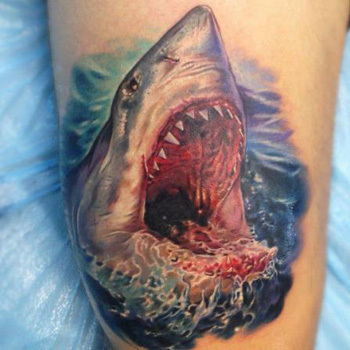 Shark Tattoos are popular with sailors, many of whom identify with the strength and primal power of these majestic animals. 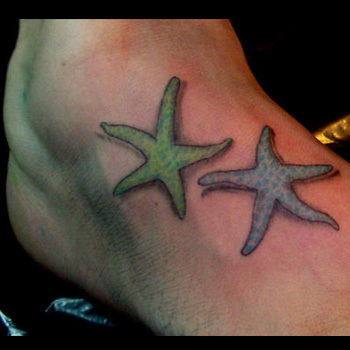 Like the Anchor, the Starfish or Stella Mara (Star of the Sea) is a revered symbol in maritime culture. As the emblems of the Virgin Mary, they represent salvation and sanctuary in the midst of troubled waters. Early Egyptians and Greeks admired its ability to grow damaged or amputated limbs, as such, the Starfish became a symbol of Healing and Regeneration. Popularly known as Siamese Fighting Fish, Betta Fish are feisty, fiery little fighters known for their beautifully colored, flared fins. They are affectionately known as 'Jewels of the Orient' because of their vibrant hues and are one of the most popular ornamental fishes in the world. Thanks to their territorial tendencies and aggressive behavior, Bettas are Lone Rangers, preferring the enjoyment of solitude to the presence of other Bettas. Getting a Betta Fish Tattoo is a way to identify with this fierce little fish and show the world that you treasure your individuality, freedom, and defiant spirit. Being openly identified as a Christian in the early days of the religion was a guaranteed death sentence. In the Roman Empire, Christianity was viewed as an instrument for rebels to usurp the Roman authorities and coordinate lethal revolts against the status quo. Many early Christians had to find imaginative ways to communicate with each other. Thus the Ichthys or Jesus Fish was born. To this day, the religious significance of this symbol is still strong in the minds of many Christians. Blue Marlins are more than majestic animals of the sea; they are an angler's ultimate dream. Every year, thousands of ambitious anglers flock to various tropical islands across the globe in an effort to bag the 'big one' and, given the marlin's reputation as a powerful, untameable fish, it's no wonder why these brave men and women are willing to risk limb and boat in their quest. The famous author, Ernest Hemmingway, understood this passion quite well and used it as the main theme of his classic novel, The Old Man and The Sea. Blue Marlin Tattoos embody Endurance, Strength, and the unconquerable spirit of a powerful persona. Dolphins are one of the world's most intelligent animals and of all the creatures in the ocean, they are the beings closest to our hearts. Long before the days of the ancient Greeks, humans have been inspired by these remarkable mammals. They are helpful, highly social, and free-spirited, and sailors believe that they are a sign of Luck and a successful voyage. 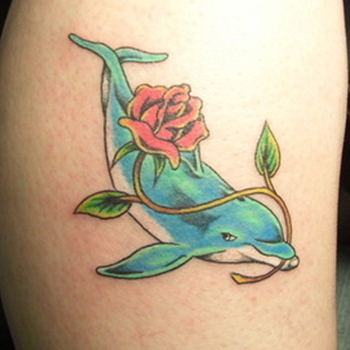 Dolphin Tattoos embody Freedom, Family, Frivolity, Harmony, and Intelligence. Whales are powerful spirits of the ocean and given their incredible size and presence, it's no wonder that humans are so transfixed by these beings. From native Icelanders to countries in Eastern Africa, many cultures have stories that hold whales in high regard as beings of ancient wisdom and creation. They are believed to be expressions of the Subconscious, since they are so closely associated with the oceans and the element of emotions, Water. 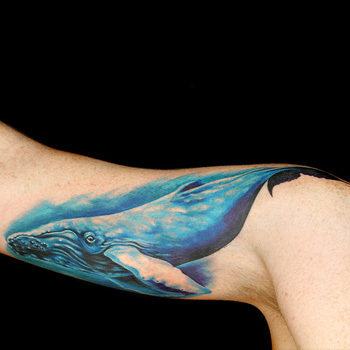 Whale Tattoos represent Creation and Intuition, and having such a tattoo means that you have a deep awareness of yourself and your role in the universe. The image of beautiful, colorful Koi fish swimming gracefully in a garden pond has become synonymous with the Japanese culture, but reverence for these remarkable animals originated in China. The Chinese legend of the Dragon Gate speaks highly of an ambitious, persistent Koi that battled the currents to swim up a waterfall. After successfully conquering its challenge, the Koi was transformed into a powerful dragon. Koi Fish Tattoos represent Luck, Success, Prosperity, Ambition, and Wealth. Although finding the right tattoo design can be a daunting task, it isn't impossible to choose a design that complements your body and conveys what you are trying to express to the world. A great design can be the difference between an uninteresting tattoo and an extra-ordinary piece of art, so it pays to take the time to get your design perfect. Think about what your new tattoo will symbolize, where it'll be placed on your body, and whether or not you'll combine it with other elements. The best ones are those that have significant meaning to you. If you need help creating the perfect tattoo design, then visit our design page at www.itattoodesigns.com and take advantage of our Custom Tattoo Design Page.